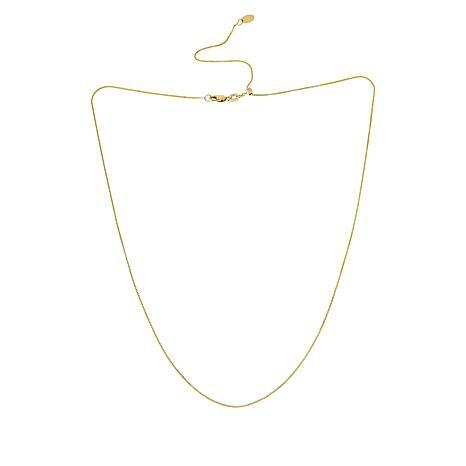 An adjustable length gives this simple box chain necklace a chic, stylish edge. 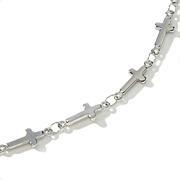 It features a lobster claw clasp at one end and an sliding bead on the other, so you can easily change from 16" to 22" or any length in between. It's a great place to park your favorite pendants, but also looks great worn solo or layered with related pieces. 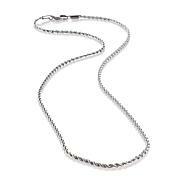 The perfect chain, because it is adjustable! I can adjust it to suit whatever neck line my shirt has. This box chain just became my favorite chain in my jewelry box! Although it's 10K and not 14K, it has a very pretty color. 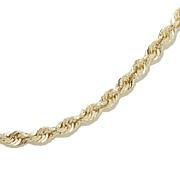 The price of gold is outrageous, and the days of a substantial weight are gone, this chain is still sturdy and will hold a fairly sized pendant. The adjustability is a plus.